Six-week series starts Sun March 30 at Smith Aquatic & Fitness Center. Time: 2:15-3:15 PM. Residents $45/NR $68. Explore the form the Ba Duan Jin / the Eight Section Silk Brocade. Learn this traditional Chinese mediative dance form which cultivates health and vitality. Adapted to all levels of ability. It is fun exercise. 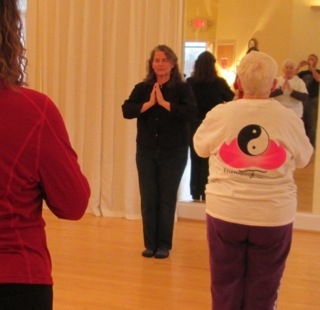 Garnett Mellen, the instructor, is certified to teach both the Alexander Technique and Level I Qigong. For more information contact Garnett at 434-422-0961 or visit www.garnettmellen.com. To register go online to https://charlottesville.org/ParksandRec. This entry was posted in News and tagged Carver Recreation Center, charlottesville parks and recreation, qigong. Bookmark the permalink.